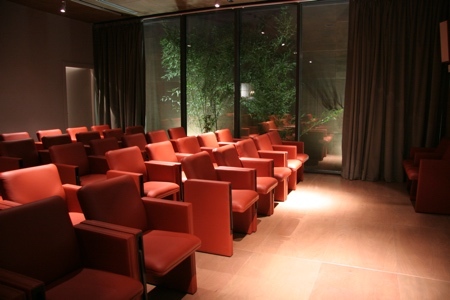 The elegant Auditorium was designed as a hall for chamber music and for holding conferences. The hall seats sixty and is equipped with a two-way array speaker amplifier system, with excellent sound quality for speech and instrumental music. There is the possibility to record on CD-R, a mixer for any links to external devices and the possibility to transmit every audio source and the conference inside the exhibition hall. 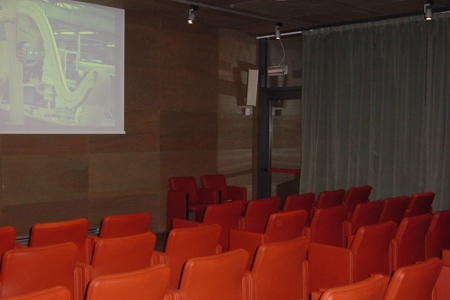 There is an on-screen video projection system, DVD player in the rack of the room to send film or video clips directly onto the projector, the possibility to directly connect laptops in the speaker table area, with a ready to use built-in socket box in the floor. Possibility of overhead projector and other video sources and to transmit every audio source and the conference inside the exhibition hall. The hall can be hired for conferences and concerts.